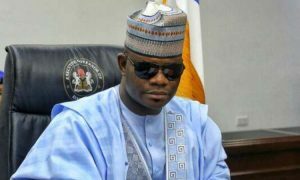 Fresh suit seeks to remove Yahaya Bello from office – Royal Times of Nigeria. on grounds that he is not a registered voter in Kogi. The suit, number FHC/ABJ/C3/535/ /2017, was filed on June 16 before Justice John Tsoho of the Federal High Court 3, Abuja, according to documents made available to newsmen on Tuesday in Lokoja. Mr Michael Elokun, Mr Ibrahim Sule and Mrs Hawa Adamu, all registered voters in Kogi are the electorate suing Bello on behalf of over 1.2 million registered voters in the state. Other defendants in the suit are: the All Progressives Party (APC), Peoples Democratic Party (PDP), Independent National Electoral Commission (INEC) as well as the Minister of Justice and the Attorney-General of the Federation. No date had been fixed to hear the suit.